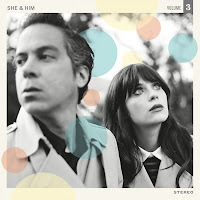 M. Ward and Zooey Deschanel are steaming the third album from She and Him, Volume 3, one week ahead of its official release date (May 7th via Merge). Take a listen atNPR.org. Produced by M. Ward and recorded in Los Angeles, Portland, and New York, the album spans 14 tracks — 11 Deschanel originals and three covers. Guest contributors include Mike Watt, Tilly and the Wall, Pierre de Reeder from Rilo Kiley, NRBQ’s Joey Spampinato, and Tom Hagerman from Devotchka.